MICHAEL SEEK: Don’t remount the bike right after the barrier at the bottom of a run-up and waste a huge amount of time trying to ride the hill instead of just remounting at the top. ANDY MCKEEGAN: I don’t know if he was a noob but the same guy continually attacked so hard that he exploded. His attacks were hard enough that I didn’t bother chasing, but another minute or two later on he’d be slumming and I’d blaze by him. CHRISTOPHER DALE: Try not to wear a ridiculous amount of clothes during the race. It may be extremely cold but you can’t race in tons of clothing. JOE LILLIBRIDGE: Helped a few people in the parking lot running either really high pressure or running too low. Something so easy as tire pressure can really make or break your race as far as handling. BETSY SHOGREN: Umm, I guess my only advice in these conditions is to do whatever you can to stay warm and dry before the race. I looked like the Michelin man out there, but I didn’t care because I started the race with feeling in my extremities, unlike a lot of competitors. Gunnar Shogren: Not impressed by your cold-weather machismo. MARK BROADWATER: I’m a newbie, this is my first full season doing cross!! I’m only getting through with the advice of my teammates, they are the best! Some of the advice I have been given is try to focus on riding the course smooth and focus on your start. GUNNAR SHOGREN: Why are you in shorts? Aren’t you freezing? You’re not, well I hate you. FATMARC VETTORI: Just warning everyone that when races are muddy and you open the port-o-let to not be startled by what you see on the floor, just a warning it’s just mud. STEPHEN CUMMINGS: I really hate seeing people ride around without helmets. There was a kids’ race, and we are who they see and try to emulate. We all know that we probably won’t crash riding to registration, but it is a time when we are most visible. MATT PARSE: If you can’t ride in the mud and slippery conditions don’t go out in front because when you fall in creates a huge pile. GREG FABER: Some dude went WAY too hard on the first lap and got to first place but halfway through the lap he faded and was dropped. Valiant effort I suppose, but all for naught. JIM CARLSON: I saw someone slow down drastically after the barriers in order to get back on their bike. You need to keep running and even accelerate before leaping back on. You’ll have plenty of time after you hit the seat to look down and get you feet onto the pedals. 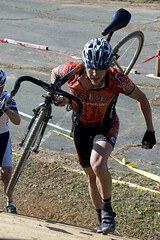 LINDSEY HILLESHEIM: I remember seeing a Cat 4 guy at Granogue stick out his outside foot AND had his inside foot down when he went around a tight turn . KRISTOPHER AUER: Always hit the line with a good attitude. You don’t need a smile on your face but be excited to race. Aim for the finish line. MARK BROADWATER: Listen to your coach, it’s no coincidence that you do well when you listen. 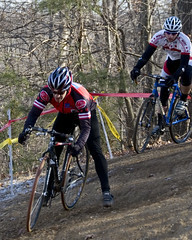 JOE LILLIBRIDGE: Other than fitness, work on keeping speed through corners, over barriers, and dismounts/remounts. Those few seconds saved through each add up as your race goes on, and if you’re off the front it’s really important to ride smooth and remount fast. 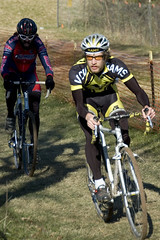 Cyclocross: Beard friendly bike racing. STEVE RISKUS: Get to races more than an hour early and stay and watch how the more experienced racers ride the same course after your done. KAREN TOURIAN: Above all, make sure you’re having fun. It takes practice and experience to feel like you know what you’re doing, but cross is about the most fun you can have on a bike, even when you don’t know what you’re doing. The race scene is great-I’ve met a ton of very cool and fun people through racing. NORMAN BRACH: Have fun. Give back to the sport. Don’t be one of the few dishrags who show up, race and go home, but still find time to complain about something that they think could have been done better. ANDREW WULFKUHLE: Ask questions and learn as much as possible about the sport, gear, training, everything because cross is a sport of inches. The racers who makes the least mistakes wins. ARLEY KEMMERER: Its super fun, the people are really laid back and more than willing to help out a new rider, so don’t be afraid to ask! The more the merrier!